Purpose: Use this document as a reference for processing service indicators for a batch of students in ctcLink. The first step in processing service indicators by batch is determining the selection tool for the populations of students. This QRG covers batch processing using an External File or PS Query. Please contact a system administrator for details on using Equation Engine. Navigate to Mass Assign Service Indicators. Search for an existing Run Control ID or add a new value using the Add a New Value tab. If creating a new Run Control, enter a name and click Add. 1.Select PS Query from the Selection Tool dropdown. 2.Select the query to use (only queries valid for the specific process are available). 3.Skip to step #11 below. Create a list in an Excel Spreadsheet with one student ID per cell in a row and save the file as a .CSV file type. Select External File from the Selection Tool list of values. Select Upload File, and then browse to the .CSV file created in step 1. Click the CreateFile Mapping link to map the file loaded in steps 3 and 4. Name the File Mapping appropriately for reuse. If the file has no header row, leave the header row checkbox and field blank. Enter the field number identifying the column containing the EMPLID in the .csv file; then click OK.
Click the Preview Selection Results link to verify the data from the file. Select the appropriate Academic Institution in the list of values. Enter or select the appropriate Service Indicator Code. Enter or select the service indicator Reason. 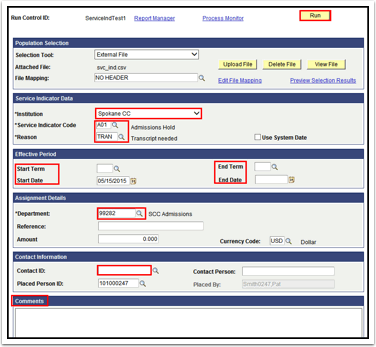 If the service indicator is term based, select the appropriate term from the list of values in Start Term and End Term. If the service indicator is date-based, enter the Start Date and End Date if the service indicator should expire on a specific date. If the service indicator is indefinite, leave the End Date field blank. The Start and End Date fields may be used in conjunction with the Start and End Term fields to specify a date range within a term. Enter a code for the Department placing the service indicators or use the magnifying glass icon to select a Department from the list. This may auto fill dependent on the UserID of the individual running this process. Enter contact information and comments if required by local business process. Click the SCC_SI_ASSN checkbox (SCC = will be replaced with unique institution code). Select the format to view the report. The student (‘s) record will now show an icon in the Student Services Center and other student pages in ctcLink indicating the active service indicator. Enter or create a new Run Control ID (see step 3 in the first section of this procedure). Select PS Query or External File from the Selection Tool dropdown. Enter the appropriate Academic Institution in the Institution field or use the magnifying glass icon. Enter the appropriate Service Indicator to remove in the Service Indicator Code field. Enter the service indicator reason code to remove in the Reason field. 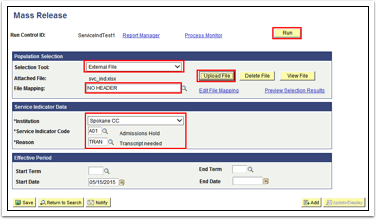 Click the Run button to display the Process Scheduler page. Click the SCC_SI_RELS (SCC = will be replaced with unique institution code).